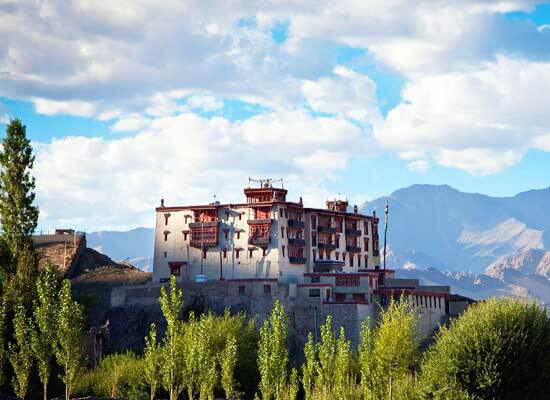 "Stok Palace Heritage Hotel, a historical property, 195 years old, lets you experience the mesmeric beauty of the pristine landscape of Ladakh. 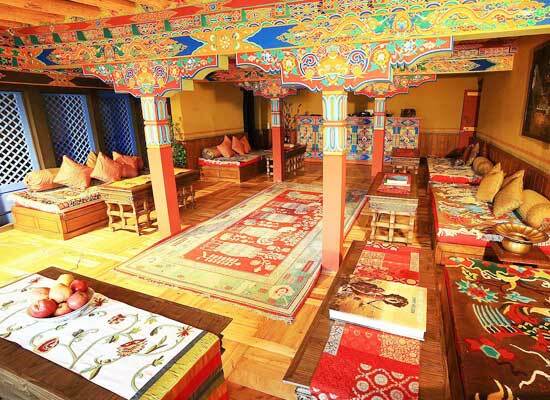 Still serving as the abode of the Namgyal dynasty, it lets a visitor relive a lifestyle reserved for the royalty. Your stay at this magnificent heritage hotel, one of the most important landmarks complexes of Ladakh region, is made memorable by the touching hospitality of the royal family. Dinners under star studded skies accompanied by the warmth of the wood fire, or staring at the moon while relaxing on a hammock, these experiences come once in a lifetime! 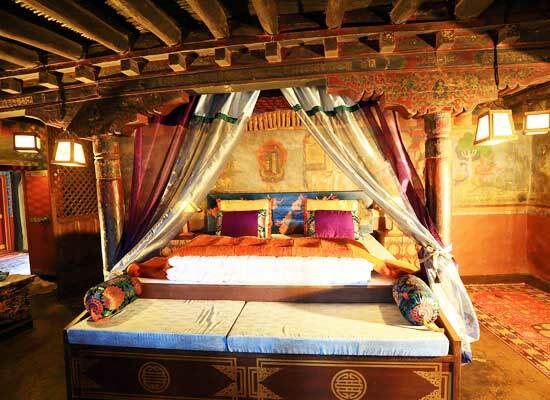 Stok Palace was built entirely by Ladakhi craftsmen in 1820, and still serves as the residence of the Namgyal dynasty. This doors of this palace were opened to the public in 1980 by converting it into a heritage hotel with the blessings of His Holiness the Dalai Lama. A decade has passed since, and yet, visitors continue to visit this place, eager to absorb the surrounding beauty amidst a royal stay. 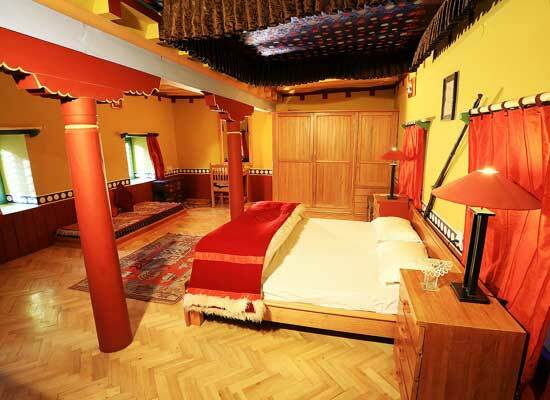 Stok Palace Heritage Hotel combines the charms of the traditional with the modern. The accommodations here range from Queens Room, Royal Suite and Four Suites which wear a traditional look. All the bathrooms here are equipped with the choicest of facilities and provide a spectacular view of the scenery outside. This fabulous palace, which is surrounded by old apricot, walnut and willow trees, lets guests enjoy apricot blossoms in the month of April. In the month of October, one is exposed to the full colors brought by the autumn season. All the rooms here face the wonderful gardens, which allow one to absorb the surrounding beauty while sipping a cup of tea or coffee or leisurely read a book. Further, the rooms are equipped with a full-fledged kitchenette with sufficient light to come in. The guests here embrace nature in all its beauty. Further, the rooms here are well insulated with natural materials. The cottage interiors are hand built, with mud and wood serving as the primary materials. Traditional rice paper, which is used for lighting the rooms, add serenity to the rooms during the evenings. The bath and powder room features are well equipped with modern amenities in a traditional setting. Stok Palace Heritage Hotel provides a holistic dining experience. Breakfasts are served on the Palace rampart which enables guests to absorb the magical views of the valley and the Ladakh Ranges. Lunches and dinners are served in special rooms that match the graciousness of the occasion. Dinners are served in the Old Royal kitchen which, apart from being extremely spacious, acquaint you with the traditional method of dining. 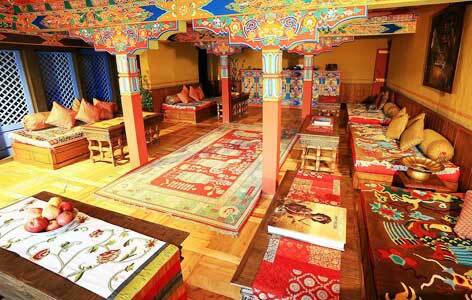 The menu here comprises of cuisines from Ladakhi, Tibetan and Indian to other cuisines. 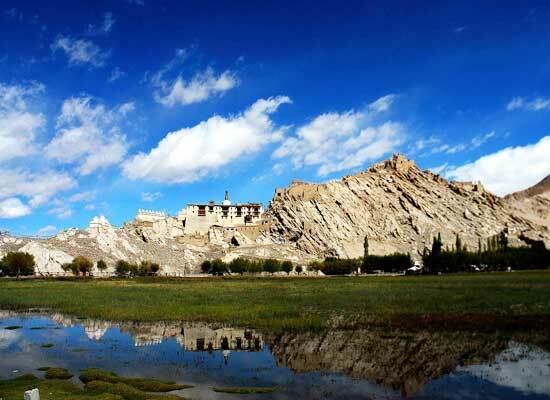 Ladakh endears itself to countless travelers due to its supernatural landscapes. From the arid and jagged mountains to the cerulean lakes below, everything betrays a sense of timelessness here. The whooshing of the wind is given a musical twist by the chants emanating from the ancient monasteries. Visitors are left completely captivated by beauty of the various attractions here such as Nubra Valley, Shanti Stupa, Khardung La, Thikse Monastery and others.